More than 15 years ALPINE ANGLER - we are already in our 17th fly fishing season! At the turn of the millennium, the company ALPINE ANGLER was born out of the idea to inspire even more people for the finest way to fish. But even for those who are already fascinated by the best sport in the world, we would like to offer our help. That is to ensure that you are able to enjoy your passion best in these fast days where free time is a real value. For one, the ALPINE ANGLER Flyfishing school offers you the opportunity to perfect your skills and expand your knowledge. The more a flyfisherman understands the complex relationships in nature and the better he can respond to the situation, the more exciting becomes flyfishing. For the novice our class and seminar program opens up the fascinating world of fly fishing. A guided day is also most effective, showing you a lot about tactics. On the other, ALPINE ANGLER offers completely organized, hosted fly fishing trips to a selection of sophisticated destinations and world-class waters, that not only give you a special experience but also a lot fun and relaxation. High-quality equipment of the most prestigious manufacturers in the fly fishing market, available here in this online shop and in our store, including individually tied fly patterns from the AP Fly Collection complete our full range of services. Within the scopes shop, school, guiding and travel, we try to give you a complete range of professional services to suit all your individual requirements. Not an easy task, but we are giving our best over 15 years - including appropriate consulting. A huge advantage of us here to point out is, that we are independent and therefore can provide neutral advice. B u t A L P I N E A N G L E R i s a l o t m o r e : It's mostly those guys who like our concept because they have the same spirit and persue the same goals towards flyfishing like we do: For one thing, there are the challenges of tricky waters and cautious, wild fish but also Casting and Fly tying are holding for us. For another thing it is the respect for nature and creature. For this reason, we support institutions such as the WWF, Trout Unlimited , an US organization to preserve wild trout populations and their habitat, and the association "Save the Isar now" e.V. here in Germany., We also promote Catch & Release, a philosophy that has long been established and proven in many countries around the world to protect wild fish populations. At ALPINE ANGLER the experience of nature and its conservation stands absolutely in the foreground, not to capture and deep freeze as many fish possible. If you have a similar attitude, we'd be happy to gain you as customer and meet you in person some day on occasion of one of our events. The fan base of ALPINE ANGLER is steadily growing - when are you joining? 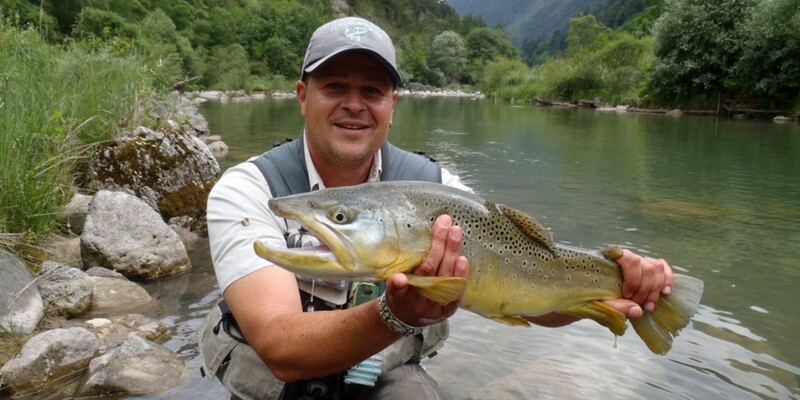 Hi, I'm Andy Pfirstinger, owner and head guide of ALPINE ANGLER. I am sharing my passion with pleasure and taught many how to fly fish, advised and upskilled fly anglers, taking them to great catches. "Tight lines"!